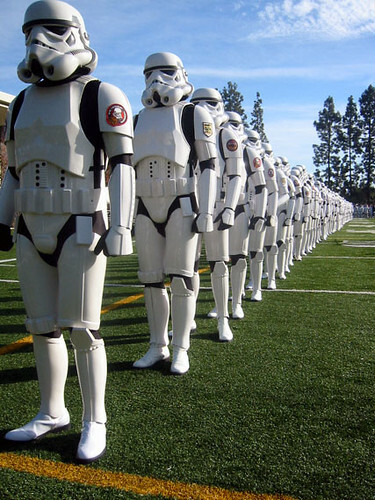 One of the main attractions at Monday’s 118th annual Rose Parade in Pasadena, CA was the Star Wars Spectacular, which featured George Lucas and 350 Star Wars characters, including 200 Stormtroopers from the 501st Legion. “During the global premiere of Star Wars: Episode III last May, George Lucas was deeply impressed by the presence of 501st Legion members around the globe, and we wanted to honor them for their loyal support of Star Wars and their global philanthropy,” said Tom Warner, Senior Director of Marketing for Lucasfilm Ltd. Members of the 501st regularly volunteer their time to support local charitable efforts. Bonnie Burton shot some great behind-the-scenes photos and is tracking all of the coverage of this Star Wars nirvana. See Boing Boing for even more Star Wars Spectacular coverage.